NITECAP: T.I. 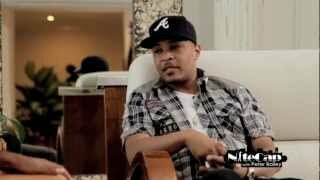 : "CELEBRATE THE PAIN"
Peter Bailey invites T.I. down to South Beach to share a NiteCap in which he discusses "Trouble Man: Heavy Is The Head", Will Smith contacting Obama to pardon him, the President's stance on the economy as well as working with Young Jeezy, Gucci Mane, 2Chainz and others to unite Atlanta's hip hop scene. So it's safe to say black artist can't come together bc of their personal gain or egos, interesting! What the tv show bosses you were talking about? I've already heard that argument and it doesn't hold weight. Black unemployment is almost always double the national average so him applying a broad stroke towards fixing the economy has not and will not help. He has to specifically address Black people the way he specifically addresses Hispanics, White people, and the LGBT community. Late response but he is correct. Fixing the economy will help poverty. Helping poverty means that mother is not held up because the suspect is now offered a job. The guy may not be killed for his Air Jordans because he has the job to get his own. hAhAhAhAhA im hoping i will, but yea, outlook doesnt look good. I have the same birthday as Will Smith and TI :).....Thanks for the interview Peter! I don't think I will either. Gotta disagree with Tip on Obama. Everyone who's Black seems to want to give Barack the presidential pardon and say he shouldn't be expected to look at issues such as inner city violence, the prison industrial complex, war on drugs, poverty, etc. If we were going to expect him to in no way represent the African American community or their needs, why take part in the political process? If we don't expect help from him, why did we vote for him?